OK, so the fact that you’re reading this article means that either you’re suffering from low self esteem, or you want to help someone else that is. Life with Confidence began life in 2005, and has gone from strength to strength. Based on personal issues with self confidence and self esteem, the site is packed with practical information on how to build both to healthy levels. Owner of the website, Catherine Pratt, is a specialist author in the field, and she’s truly passionate about her subject. This shines through in all the articles, guides, and resources available here – truly an excellent resource. The British based charity, Mind, has an excellent website with all things to do with building self esteem. Read real life blogs and stories from those who’ve suffered, and what they’ve done to build themselves back up again. You can also follow relevant news and campaigns. OK, so it’s a British website, not a US one. But the issue is the same on both sides of the pond. An excellent resource. Now, Aitchison’s website isn’t just about building self esteem. It’s more about building a better you – period! But the thing is, self esteem is a massive part of this, and there’s some wonderful articles and blogs here that will honestly help you on your goal to raise your self esteem. Because all does come from within. And if you do what you can to change your way of thinking, then you’re well on your way to improving your self esteem. The website of Jonathan Wells, Advanced Life Skills is a great resource for learning how to improve your life in every way imaginable. If you’re looking for a positive place to begin building your self esteem, then this is a great place to start. It’s all about positivity, and improving this aspect of your thought process is crucial to increasing your self esteem. From the blog to the quizzes, the natty quotes and the free ‘Power Habits’ download, this site really will set you on the right road to re-building how your feel about yourself. There’s something incredibly empowering about discovering how other people have overcome their life challenges. Think Simple Now is all about how real folk have done just that – and how you can too. Life IS simple. We’re just too good at making it difficult. This great website will show you where you’re straying from the ‘simple’ path, and what you can do to change that – and increase your self esteem along the way. Possibility Change is another website where you can discover how regular people – just like you – have created change in their life. From increasing their self esteem to overcoming lifelong fears – if you want to do it, the power truly is within you. Rather relationship based, but this is one of the clinchers for many when they find they’re lacking in self esteem. Let’s face it, a break up is a cue for any one of us to not feel so great about ourselves. The Bridgemaker covers many aspects, such as how to let go of negative thoughts, forgiveness, happiness, faith, gratitude… The list goes on. And don’t underestimate how important such factors are when working on improving your self esteem – even if a relationship breakdown isn’t the cause of your low self confidence. Mind Tools isn’t solely a self esteem building website, but it has some great articles and videos presented by their content team. 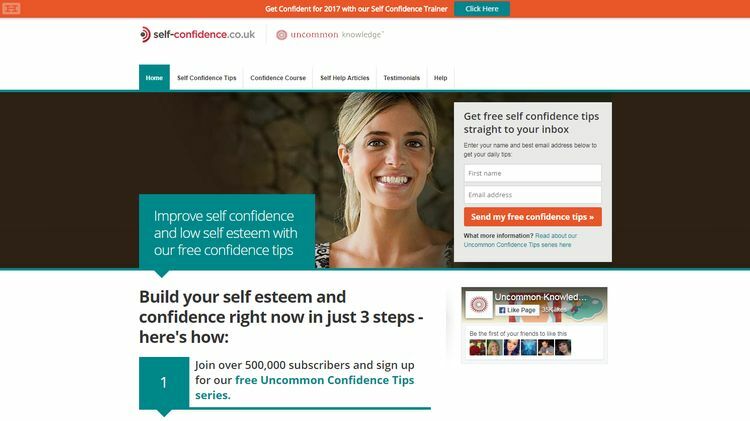 It offers some excellent advice, as well as top tips about balancing being under-confident with over-confidence. The thing is, low self esteem can strike anyone at anytime – yes, even the most confident seeming of people. This website combines advice in raising self esteem with other great learning opportunities, such as leadership, problem solving, and decision making. Because together, these all have a bearing on your confidence and self esteem. The simply named, Self Confidence website isn’t anything fancy, but it does offer some great tips and articles on how to raise yours. Over half a million people have signed up to avail themselves of this free information, showing how good the quality of advice is on offer. OK, there are some ‘paid for’ options too – but there’s no hard sell or pushing of these on you. Simply check out the articles, and sign up to receive the daily ‘Uncommon Confidence’ tips that are sent out by Creative Director and website owner, Mark Tyrrell. The website of Karl Perera, he started his website in order to help others who suffer from a lack of self esteem. More Self Esteem is the result of years of hard work by Perera, and he continues to add to it regularly. Like so many others, he started the site because of his own issues with self esteem, and the problems this can bring with it (depression, anxiety, etc. ), that often become debilitating if you can’t get over that all too difficult hurdle.